One of the fundamental aspects of any management solution is the ability to perform tasks and record events. The Device Task Board described below is used to record and archive the tasks that have been performed as a part of the management process. The Device Task Board is also used to examine the tasks on a granular basis when required to indicate why tasks may have failed. The task level view lists the tasks that have taken place. Tasks are listed in chronological order with the most recent at the top. As shown above, task lists are generated with full details, including the task description, date, the number of devices, state the task finished at as well as the number of sub-tasks that completed. In addition, the failed tasks are clearly indicated in red. You can drill down into a task by double-clicking on its listing or by examining the entire set within the Command View. By right-clicking, you have access to various functions such as shown in the menu below. 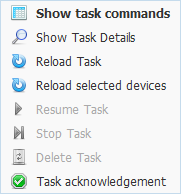 If you wish to re-select the devices that received a previous task - or that failed to execute a previous task - you can use the Reload selected devices option. The Command Level view shows which of the task’s individual commands have completed and to what extent. As shown below, several commands have not completed and their state is indicated by the colored status bar. 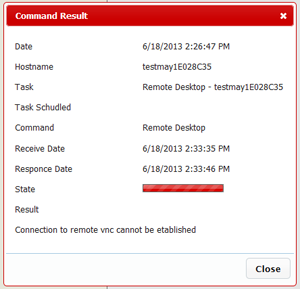 Double-clicking on the command displays the Status Info for that particular task. 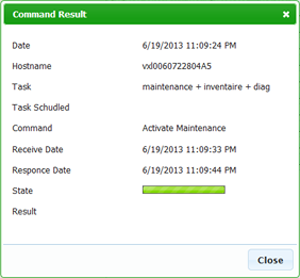 However, if the command was not successful, the status window will indicate the failure and its reasons, as shown at right above.